Also known as the Savannah Campaign, Sherman's March to the Sea, was a Union offensive in late 1864 that cut a swath of destruction across Georgia about 60 miles wide and 250 miles long, from Atlanta to Savannah. Following the Federal breakout from Chattanooga in November 1863, Major General Ulysses S. Grant was promoted to the special rank of Lieutenant General and placed in command of all Union armies. Grant moved his headquarters to Washington, DC, leaving his trusted subordinate, Major General William T. Sherman, in command of Federal operations in the western theater. Upon arriving in Washington, Grant's primary military strategy was a coordinated effort to attack and defeat the two main Confederate armies in the field, Robert E. Lee's Army of Northern Virginia in the east, and Joseph E. Johnston's Army of Tennessee in the west. On May 5, 1864, Grant launched his Overland Campaign against Lee in Virginia. Two days later, Sherman launched his Atlanta Campaign in the West. 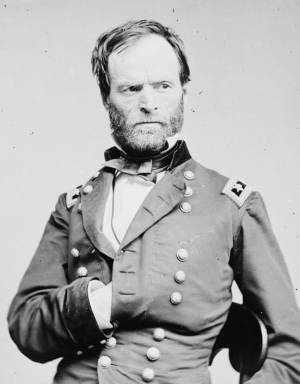 Employing a series of flanking maneuvers, Sherman persistently drove the Army of Tennessee south toward Atlanta. On July 17, 1864, Confederate President Jefferson Davis, relieved Johnston of his command and placed General John Bell Hood in charge of the Army of Tennessee. Hood proved more willing to fight than Johnston, but the results were the same. By July, Hood's army was bottled up in Atlanta. On July 20, Sherman ordered his artillery to begin bombarding Hood's lines, as well as the city, which still harbored approximately 3,000 civilians. The shelling lasted for five weeks, but Hood continued to hold on as long as he was receiving supplies. Toward the end of August, Sherman stopped the flow of supplies into Atlanta. With his main supply line severed, Hood evacuated Atlanta on the night of September 1, burning all military stores and installations. Sherman's forces occupied the city on September 2, ending the Atlanta Campaign. Sherman occupied Atlanta for the next two and one-half months. During that time, he convinced President Lincoln and Grant to allow him to embark on a daring operation, dispatching part of his forces in pursuit of Hood's army, while Sherman personally led an invasion force across Georgia toward the coastal city of Savannah. In a telegram to Grant, dated October 9, 1864, Sherman stated that he would "make Georgia howl." He intended to do so by living off the land and destroying the property of Georgia civilians. Sherman argued that his operation would demoralize the South, thus ending the war sooner and ultimately saving lives. Although Lincoln and Grant had reservations about Sherman isolating his army by cutting communication and supply lines, they approved of the plan. Before evacuating Atlanta, Sherman ordered "the destruction in Atlanta of all depots, car-houses, shops, factories, foundries." After stripping the city of all materials that could be utilized by the South, the designated destruction began on November 12. Unfortunately, before Sherman's army evacuated the city, Union soldiers engaged in unsanctioned arson, torching private residences and much of the downtown. Sherman left Atlanta on November 15, 1864 with roughly 62,000 soldiers (55,000 infantry, 5,000 cavalry, and 2,000 artillerymen). His army traveled in two columns; the right wing was the Army of the Tennessee, commanded by Major General Oliver O. Howard, and the left wing was the Army of Georgia, commanded by Major General Henry W. Slocum. For the next five weeks, the Yankees cut a swath of destruction across Georgia about sixty miles wide and 250 miles long. Although looting was prohibited, foraging parties were authorized "to gather turnips, apples, and other vegetables, and to drive in stock of their camp." Sherman further instructed his foragers, who came to be known as "bummers" in the South, that "In districts and neighborhoods where the army is unmolested no destruction of such property should be permitted; but should guerrillas or bushwhackers molest our march, or should the inhabitants burn bridges, obstruct roads, or otherwise manifest local hostility, then army commanders should order and enforce a devastation more or less apples." Northern soldiers took mules, horses and wagons that might aid the Union advance. Finally, Sherman instructed that "Negroes who are able-bodied and can be of service to the several columns may be taken along, but each army commander will bear in mind that the question of supplies is a very important one and that his first duty is to see to them who bear arms...."
Sherman met very little resistance from the rapidly depleting Confederate army during his "March to the Sea." On November 22, a Federal force of six infantry regiments commanded by Brigadier General Charles Walcutt engaged three brigades of the Georgia State Militia near Griswoldville, while approaching Macon. Walcutt's soldiers withstood three determined charges before being reinforced and driving off the enemy. On November 28, Major General Joseph Wheeler's cavalry corps attacked Union Brigadier General Judson Kilpatrick's 3rd Cavalry Division as it engaged in the destruction the railroad near Macon. Although Wheeler surprised the Federals, Kilpatrick's troopers withstood the assault and inflicted much higher casualties (600 to 40) in a Union victory. On November 30, a Union expeditionary force of 5,000 soldiers commanded by Major General. John P. Hatch failed to dislodge 1,400 Confederate regulars and militia under Colonel Charles J. Colcock at Honey Hill. On December 4, 1864, Kilpatrick and Wheeler engaged again near Waynesborough. Kilpatrick's cavalry met stiff resistance before forcing the Rebels to abandon their defensive positions and to flee. Sherman reached the outskirts of Savannah by December 10, 1864 and discovered that the city was protected by 10,000 Confederate soldiers commanded by Lieutenant General William J. Hardee. Hardee's men were well entrenched, and they had flooded the fields around the city, limiting access to a few narrow causeways. Sherman realized that he would have to invest the city, but he did not have enough provisions or equipment at his disposal to do so. Thus, he ordered the commander of his right wing, Major General O.O. Howard, to seize Fort McAllister near the Georgia coast to open a supply line to the sea. Howard assigned the task to Brigadier General William B. Hazen, commanding the 2nd Division, XV Corps of the Army of the Tennessee. Hazen's men attacked the fort on December 13, meeting little resistance from the 120 men garrisoned there. With a secure supply line established, Sherman prepared to capture Savannah. On December 17, Sherman sent a message to Hardee demanding his surrender under threat of bombardment and starvation. Rather than surrender, Hardee chose to escape on December 20, leading his men across the Savannah River over a hastily erected pontoon bridge. On December 21, 1864, Savannah Mayor R. D. Arnold surrendered Savannah in exchange for a promise to protect the city's citizens and their property. Later that day, Sherman telegraphed President Lincoln, "I beg to present you as a Christmas gift the City of Savannah, with one hundred and fifty guns and plenty of ammunition, also about twenty-five thousand bales of cotton." Three days later, Sherman wrote to Army Chief of Staff Henry Halleck, "We are not only fighting armies, but a hostile people, and must make old and young, rich and poor, feel the hard hand of war, as well as their organized armies. I know that this recent movement of mine through Georgia has had a wonderful effect in this respect. Thousands who had been deceived by their lying papers into the belief that we were being whipped all the time, realized the truth, and have no appetite for a repetition of the same experience." In the aftermath of the Savannah Campaign, Grant and Sherman decided that Sherman should move north and help Grant defeat Robert E. Lee's Army of Northern Virginia. Rather than move his army by steamer, Sherman persuaded Grant to let him march north through the Carolinas, exercising his scorched earth practices along the way. His soldiers were especially destructive in South Carolina, the first state to secede from the Union. Federal forces captured Columbia, the state capital, on February 17, 1865, and fires that night destroyed most of the central city. The source of the conflagration remains controversial to this day. Some, including Sherman, claimed that Southern soldiers started the blaze by burning bales of cotton as they retreated from the city; some claimed that the fires were deliberate acts of vengeance by Yankee soldiers; while still others claimed that the source was accidental. Whatever the truth, the burning of Columbia contributed to Sherman's status in the South as the most detested of Union generals. Celebrated in the North and reviled in the South, Ohioan William Tecumseh Sherman was a prominent Union general during the American Civil War. An accomplished soldier and able leader, Sherman is best remembered for warring against civilians during the Savannah and Carolina campaigns, which left a swath of destruction across the South during the latter part of the war.